Pumps range in performance from 10 GPM to 8,500 GPM and more and can be driven by a gas or diesel engine or electric motor. 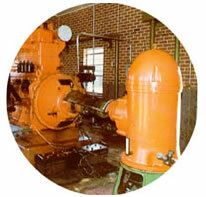 The industries and markets served by pumps include: automotive manufacturing, chemical, petro-chemical, petroleum, storage tank cleaning, processing, paper, construction, above ground mining, below ground mining, utilities, municipal, agriculture, irrigation, parks and recreation, theme parks, government, O.E.M. (original equipment manufacturers), aircraft refueling, sewage, and package lift stations.